connect...and LOOK GOOD DOING IT! FASHIONABLY DECLARE YOUR LOVE FOR YOGA & WINE! 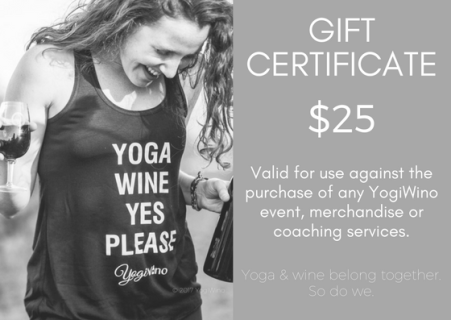 ​YogiWinos break convention. We indulge in a tall glass of vino AND take care of ourselves. Because self-care isn't about ELIMINATING fun. ​NOTE - PRICING INCLUDES STANDARD MAIL DELIVERY IN CANADA. EMAIL TO MAKE OTHER ARRANGEMENTS. Show the world how brilliant, resilient AND unique your light is in this lightweight and super-soft racerback tank. Machine wash cold and inside out; hang to dry. Wear the YogiWino hashtag proud in this sporty, racerback tank. Gift certificates are available in any denomination. Email today for amounts not shown here. Life is all about connections. So, connect with me. Drop me a line to find out more about my one-on-one sessions, upcoming events/retreats, private bookings or to pre-order your YogiWino swag!